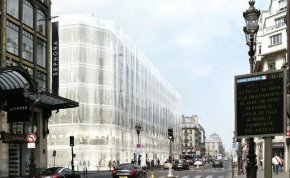 The Samaritaine’s Construction Permit Cancelled ! A view of the project replacing the 19th c.
13/5/14 - Heritage - Paris, Samaritaine - The sentence was unexpected and opens up new horizons for supporters of Parisian heritage. The Tribunal Administratif of Paris has just cancelled the construction permit for the Samaritaine building which was supposed to go up on the rue de Rivoli on the site of the recently destroyed houses. This is nevertheless a bittersweet victory. We cannot forget the fact that a private company was allowed to almost entirely demolish a block of old houses dating back to the 17th, 18th and 19 centuriesIn the heart of the French capital, and with the blessing of the Mayor of Paris and the Ministry of Culture, abetted by the initial decision of a judge from the Tribunal Administratif which carried "a manifest legal error". The act recalled the heyday of rash urban planning in the 70’s. Alas, these houses will obviously not be rebuilt. However, we can hope that the beautiful building still standing on the corner will be preserved and the construction which is to take place where the old houses were, will fit in more aesthetically than the one originally planned (ill.). The sentence handed down by the Tribunal Administratif is based on the Parisian PLU (Plan Local d’Urbanisme) which says explicitly : "The new constructions should be integrated into the existing urban context, by taking into account the morpholocal and typological characteristics of the neighborhoods (vertical rhythms, width of the façades on the streets, reliefs...) as well as those of the existing façades (rhythms, scales, ornamentations, materials, colors...) and roofing (roofs, terraces, retreats...)." The lawyers representing the Samaritaine and Paris City Hall lost their breath pleading the case, as confirmed here, that the building integrated itself into the existing urban context. The judges at the Tribunal Administratif decided otherwise, despite the conclusions of the public reporter which were in favor of the first. The good news about this sentence is that the construction permit cannot be authorized again without first modifying the project in a very significant way.